Inder Loves Folk Art: Something small for a small baby. Our friend Pauline is now home with her new baby and out of danger, and we are so grateful and happy for her whole family! Of course, I just had to make her little baby a few small things. 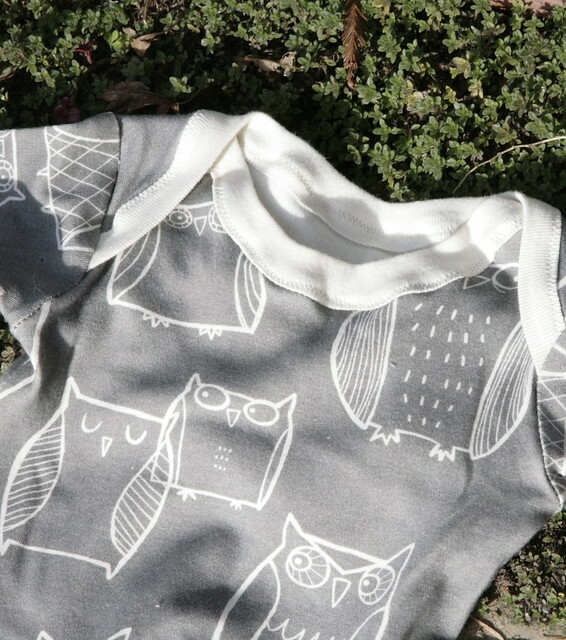 Remember that owl fabric I got from Spoonflower a couple months ago? Well, it has been sitting patiently all this time, waiting for the perfect project. And here's the perfect project! A "Baby Sleep Sack," a.k.a. "newborn gown thingy-ma-jig" for Pauline's baby girl, Aspen. Wide awake owls. For a sleep sack. Hehe. I am so clever and funny. This neckline turned out so much better than the "Flashdance top" I made Joe! This is size 0-6 months, and although I don't have any newborns close by to measure it against, it seems pretty big to me. Definitely closer to 6 months than 0 months. But I'm hoping that's a good thing: Most parents gets heaps of newborn-sized clothes before their baby is born, and fewer bigger clothes, right? It's good to have a few things for baby to grow into. Before sending this package off, I'm working on another small item to include. I'm excited. More about that soon! Hope everyone is having a nice weekend! Speech update/random tangent: Joe says "brachiosaurus" now! And I gotta say, it's really pretty hard to be worried about the speech development of a kid who can identify dinosaurs. We're so proud. He regularly uses three word sentences now, and can express a lot of basic and not-so-basic (i.e., wacky and hilarious) ideas. Joe will be getting assessed for school district services in the next couple of months (he ages out of the Regional Center when he turns three in May), and honest to goodness, we will be happy if he qualifies for services (because the services sound awesome and fun) and we will be happy if he doesn't (because that would mean his delay is now considered minor and not warranting intervention). Basically, Joe's still a bit behind his peers but WOW: he has come a long way in the past eight months! Wow, that sleep sack turned out so beautifully! Just like a bought one, only way better, cos it's made by you with love. Yeah, the Spoonflower knits are pricey but the fabric is such superb quality, and organic, not to mention the mind-blowing array of possible prints... worth the investment now and then I reckon. If you were to pay retail for an organic cotton sleep sack like that, I'm sure it would be outrageously $$ and still probably made by someone underpaid in the third world. Brachiosaurus? Awesome. Joe's been saving his speech powers for the important things. A nearly 2.5 year old saying 'brachiosaurus' - one clever kid! Oh I love it! What a great gift. That fabric was worth the splurge for sure! So glad to hear that your friend is doing better and baby and mama are safely together and mama is healing now. I read an article in Mothering a few years ago about post-birth infections and its haunted me since. I'm so so glad to hear that she's on the mend. Great sleep sack, and the fabric is so much nicer than anything I've ever seen for sale. I need to check out your source. And they let you design fabric?! That would be too much fun! I love hearing about hoe Joe is progressing with speech. It's gotta be so much fun hearing him talk about what is on his mind. Especially if he's thinking (and talking!) about dinosaurs. so sweet and go joe! Yay! I'm so glad to hear that your friend is home! And, yay for Joe! Look at him talking up a storm! Thanks everyone! I'm pleased with it! I made another cute little project for Aspen; just need to photograph and post! Thanks for all of the good vibes for Pauline & family, and for my little talker, Joseph Roscoe. Hard to believe that eight months ago, he said only a few (like five) words and animal sounds! Folkhaven: You should not fear patterns, they make your life easier! Especially these days when you can do so much internet research before you even begin to make sure the pattern is a good one. Oops! I meant to say, RosieDreams, don't fear patterns, of course! :-) Thanks again, everyone, I love my little internet sewing community. Oh my goodness! That is so cute it makes me almost want to have another baby! Nice work! Super cute and awesome sewing work! This is so adorable. I agree that the Spoonflower fabric is pricey but it sounds like you get what you pay for, or at least it's worth it. It is so great that Joe is talking like crazy, brachiosaurus?!? Amazing!